At Gullruten, the Norwegian "Emmy's," My Daughter the Terrorist won the Best Norwegian TV Documentary award. Surprised and delighted, producer Morten Daae and director Beate Arnestad accepted the golden trophy, along with their associates in the production team of DOP Frank Alvegg, sound recordist and camera assistant Tordis Lovise Bersaas, and production manager Elisabeth Todal. In her acceptance speech, director Arnestad reminded the audience about the current horrible conditions in Northern Sri Lanka. Yesterday, Beate Arnestad received the award for Best International Feature-length Documentary at the Message to Man International Film Festival. Mrs. Arnestad travelled directly to St. Petersburg after screening the film at Grimstad in Norway. – I am delighted at the reception of the film, and am really thankful to both the festivalgoers and the jury, Mrs Arnestad said after receiving the award. Next appearance for the film is in Estonia, at the Pärnu festival in July, where the film will compete with six other films for the Estonian People's award. "My Daughter the Terrorist" has been selected to compete for Best Norwegian Documentary in the Norwegian Short Films Festival in Grimstad, Norway. Netherlands broadcaster VPRO today confirmed the acquisition of My daughter the terrorist. The documentary just premiered in Japan as "the best this season", according to sources in NHK-BS1. President Rajapakse yesterday stated that "democracy can be a deadly joke" when it makes terrorism possible, after giving police and military forces wide authorisations to make searches and arrests, according to the Hindustan Times. Only hours after the announcement an explosion ruptured one of Colombo's main water supply pipelines (pictured), LankaEverything.com reported. "Just implementing the Prevention of Terrorism Act is a violation of the ceasefire agreement," said Thorfinnur Omarsson, spokesman for the Sri Lanka Monitoring Mission, which oversees a truce that now holds only on paper. "We worry that this might distance the parties even more," he added. "But then both sides have been violating the ceasefire agreement nearly every day, so it begs the question: where does the agreement stand?" Reuters reports. Sales agent TV2|World reports that the japanese channel NHK-BS1 will broadcast the documentary in Japan. Similarly, the Norwegian broadcaster TV2 has purchased broadcast rights. 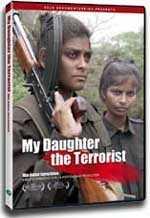 The main characters of "My Daughter the Terrorist", Darshika and Puhalchudars' whereabouts are unknown. Enquirys about them to the guerilla leadership are unsuccessful at this point. Director Beate Arnestad and co-director Morten Daae are now editing "My Daughter the Terrorist". - None of us speak Tamil, but we seem to be developing a good sense of the rhythm of the language, smiles Arnestad, the director. The team uses accurate translated transcriptions in addition to the on location translation. Beate Arnestad, who up to this point has been credited as “John Smith” due to safety reasons, have returned to Norway and is preparing to start editing “My Daughter the Terrorist” with co- director Morten Daae.